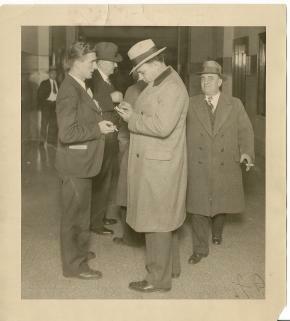 My brother Alan sent this old picture of our dad as a young newspaper reporter for the Chicago Times (he later became a City Editor for the paper which ultimately became The Chicago Sun Times). Amazingly in this picture, he is interviewing none other than Al Capone, shown on the right. One of the other events in his reporting career was that he was the first reporter on the scene of the famous Chicago Saint Valentine's Day Massacre. He went on to become the Director of Welfare for the city of Chicago, and then Executive Director of the Chicago Housing Authority before retiring in 1967 to Oceanside, CA. 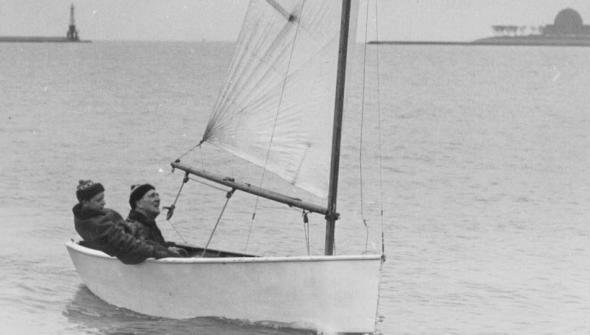 My dad and I had many wonderful experiences together sailing in Chicago's Monroe Harbor in Ding Ho. It was our form of communication. These times in our boat formed memories that I have always remembered and always will. The picture shown was taken of us one cold winter day in Monroe Harbor when I was about 10. In the distance to the right, you can see Chicago's Adler Planetarium. I can remember having to shovel a path through the snow to get to the boat where we pulled it up onto the dingy floaters by the Columbia Yacht Club. We would sail around ice ringed bouys. We sailed in snow and sleet storms. As long as the wind wasn't too strong to create danger, we would sail. In fact, I stronly suspect there isn't a month of the year that I didn't sail Ding Ho in. 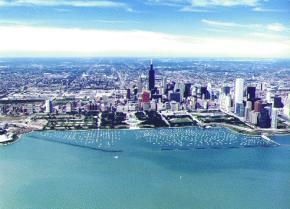 And Chicago winters are something to behold! No matter how hot or how cold... my dad and I would be out in Ding Ho. We considered our lunacy a badge of honor, much to the dismay of my mother. Mom just shrugged it off with a smile when we would come home with tales of the day's adventure. And what a great place to sail Monroe Harbor was! In the summer, the harbor was packed with boats of all types and sizes. The members of the Penguin fleet were all well known. We should be: we dodged among the moored boats with rather wild — but controlled — abandon. Our race course took us through the fleet as well! Lake Michigan can be pretty tough outside the breakwater - a place we didn't venture too many times. The harbor was so large that you could spend well over an hour just sailing from one end to the other. And there was always the quick and daring dart just outside the breakwater when we would pass the mouth of the harbor. Dad was extreamly competitive as a person in general. But in Ding Ho he was possessed! You could see his jaw tighten as we would approach another sailboat leisurely coasting along. His grip would tighten on the tiller, and his eyes would sort of glaze over. He would start quietly giving weight distribution or sail trim commands through clenched teeth. He was racing! Didn't matter that the other guy had no clue. Dad was racing! He was always racing. In fact, much to my amazement and humor, I crewed with him to victory over a gaggle of swimming geease; that's how competitive he was. And this is the guy that taught me to play chess and poker! 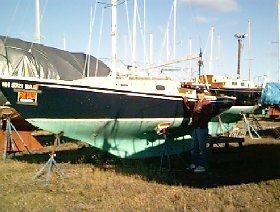 Shortly after moving into my home on the water in Dover, NH, I purchased an old 18' beat up '72 O'Day day sailor. I love it. I do not, however, love working on boats. I enjoy sailing them, but I don't do maintenance. That is why I bought this boat: it's a wreck! But I spend all my time sailing and none in maintenance. And, I don't ever have to worry about scuffing up the bottom or scratching the deck. I can just sail! I know you're envious, and well you should be because no one can possibly be having more fun than I am! I used to try to get out as much as I can, but it's never enough! In fact, I wrote "A Rant Concerning Going Sailing" web page about this. 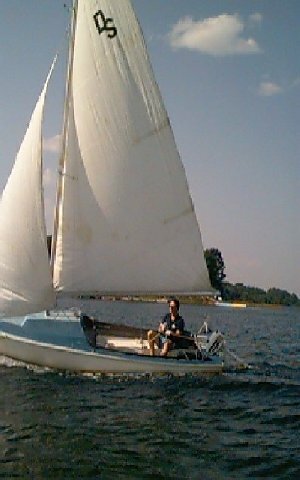 Sailing has been a big part of my life. When I am not doing something technical, I am doing/reading/dreaming sailing! Like the guy walking across the street said at the end of the movie Pretty Woman, "Everybody's gotta have a dream!" 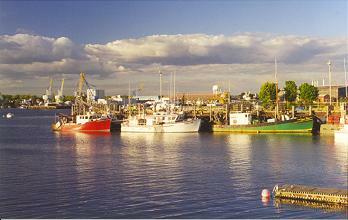 The whole seafaring atmosphere that the Seacoast has to offer just can't be matched. I suppose that the sea runs deep in my veins. My great-grandfather was a whaler out of New Bedford, MA under our original Portuguese name of Rosa. My father was a Lt. Cmdr. in the Navy and has been on the water most of his life. And my brother Alan was a Yeoman during his term in the Navy, then going on to teach English at the U.S. Naval Academy, Annapolis, MD. I have been fooling around with computers since 1970. Back then (way back then), we used punch cards to enter our programs into an IBM 360. Ever hear of doing that before?! If not, then you have missed one of the true joys of programming! For all of you GUI/drag-'n-drop kids, you just haven't been around the corner unless you can brag like this! So, I opened my own business, the Rose School of Karate in Portsmouth, NH, as the only means of gainfull employment available to me other than going out to live with my folks in Oceanside, CA where they had moved after retiring. The very real possibility of ending up out there pumping gas and learning the fine art of saying, "Will that be one scoop or two?" until I could determine whether it was time to grow up and figure out what I wanted to do for the rest of my life was not appealing to me at all. I made my living for over 12 years operating my school. In 1981 I cut back on my karate business, and took months of training to become a tax and estate planning consultant. The thrust of that job was cold calling. Well, I found out really quickly that I absolutly hate cold calling! And thus, that was the end of that career path. Come to think of it, I did an awful lot of stuff during those 12 years! By 1981, I was deep into technical analysis and price movement simulation of stocks and commodities (an interest that remains to this day) writing thousands of lines of Pascal. In mid '82, a guy wandered into my karate school inquiring about classes but had to pass because of the business he owned. "What sorta business do you have? ", I casually asked. Turns out, it was a software development company! I mentioned my current work to him, and invited myself over to see what they were doing. He offered me a job. "Can't pay you much, but we'll teach you C and you can get paid for programming instead of doing it just for s&g." It took me all of 1 minute to accept! Their "teaching" me C consisted of a very worn copy of Kernighan and Ritchie being tossed onto my desk. Two weeks later I was into the depths of applications programming in C and dBase II (which I also had to teach myself, along with cEnglish, dBase III+, and some UNIX!). I stayed with them for several years ending up as the Director of Production and Shipping. The company closed, and I was on the street again. I picked right back up where I left off with my Pascal analysis of commodity price movement. From this analysis, I began to paper trade futures and summarizing my thoughts in a still as yet unfinished/unpublished book on commodity trading. 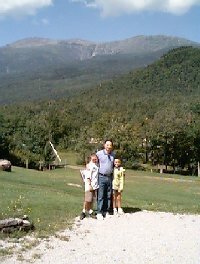 I did a non-technical stint as a New Hampshire and Maine licensed mortgage broker with a private mortgage banking company ending up as its Vice President of Brokerage Operations (very lofty title for a small shop) when that company closed in the recession (depression for me!) of 1990. From there, I fanagled my way sort of back into the technical arena in 1992 first as a technical recruiter and then as a software engineer developing business applications in FoxPro (again, self taught) for the agency. I moved on to a short stint with another local software development company doing FoxPro. Short because after a year there, they decided they were no longer interested in developing applications, and so I went on board with NECX in September of 1995. 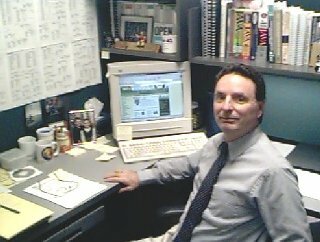 After spending four and a half years with NECX, in January of 2000 I was offered the position of Head of Technical Operations at ProfitTools in Newmarket, NH. ProfitTools builds dispatch and operations software for the trucking industry. Until the company ran into financial problems in Augest of 2000 when I got "two weeks check and a roadmap", I was in charge of organizing and managing all technical aspects of the company's software development efforts. In January of 2001, I joined SITA Advanced Travel Solutions (formerly Equant Application Services) in Burlington, MA as a Senior Software Engineer doing Java development for reservations and booking systems for the travel industry. Unfortunately, SITA closed the Burlington office in April of 2003 and I was on the bricks again until March of 2004 when I went to work as a Senior Programmer/Analyst at L.L. Bean in Freeport, ME. And so it goes after leaving Bean continuing developing web based business applications. Great fun! Keeps me sharp and allows me to express myself creatively other than through the martial arts, my writing, and all the other things I am involved with.